Let’s be honest, we all dream about healthy smoothies to kick-start our day but how many of us are actually half awake in the morning to really make it!? Introducing Smoothie Bombs. 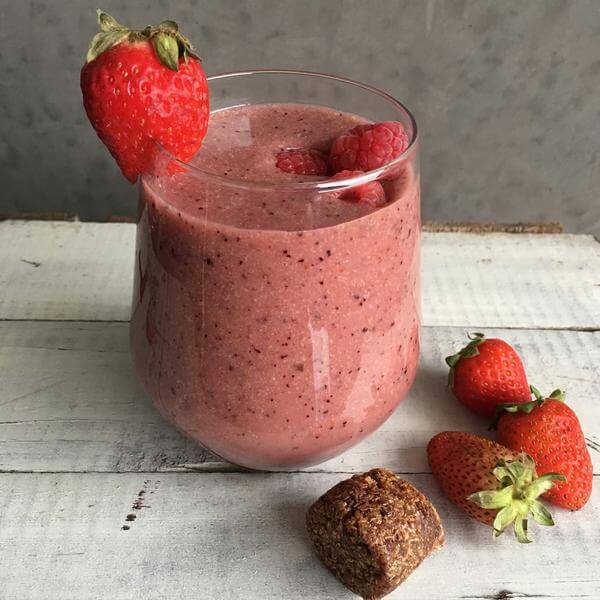 A gluten free, dairy free, refined sugar-free, paleo and vegan-friendly ball-shaped booster packed of so much goodness that you simply crumble into the blender, add a piece of fruit with your preferred milk, hit the button and then pour and drink. Super mum, Cinzia Cozzolino started in her kitchen around 5 years ago after her youngest daughter kept skipping breakfast. This nutritionist knew the importance of having a nutrient-rich kick start to the day and was determined to find a solution that was easy, simple, packed with flavour and nutrients without leaving a trail of destruction in the kitchen. From its humble beginning, Smoothie Bombs are now stocked in local cafes, pharmacies and food stores as well as on the Smoothie Bomb website. A. The product is a pre-portioned booster for your smoothie, combining 10 natural certified organic ingredients. Instead of purchasing often pricey superfood powders, and figuring out how much of each to put in, simple mix 1 bomb with a piece of fruit and liquid for a consistent nutrition packed smoothie. A. I created the ‘Bomb’ concept to get my daughter to eat breakfast. She was going off to high school on an empty stomach and I had to find a quick easy way to get some nutrients in her. Q. You also run Nutrition Darling. Can you tell us a bit about this? A. I started Nutrition Darling 7 years ago. My drive to become a nutritionist came from my passion for healing foods. I began making a range of raw vegan cakes for my friends cafe and it grew from there! I also sell a range of organic gluten-free mueslis and have lots of other products coming down the line. Q. How do you juggle personal life and working full time? from business to personal happens. Q. Why is the ‘whole food ‘ movement so important in our everyday lives? A. We are a time-poor population and need real, whole foods to give us the energy to tackle the day. Q. Food tips and tricks for eating on the run? A. Well I can’t go past a good smoothie! ? Seriously though, you can get some great nutrients in a well-made smoothie. Also snacks in your bag like fruit, bliss balls or mixed nuts and seeds are good to tie you over between meals. Q. What does your everyday beauty routine look like? A. It’s simple. Wash my face, add MUSQ replenish serum and a drop of tinted moisturiser then brush my teeth and I’m out the door! Sometimes I even brush my hair hahaha! Q. Tip for gals in business? A. Get savvy, be generous and be social. The best way to get your brand/service out there is to talk it up ? calls on the go so need to write stuff down or I’ll forget. Go to MUSQ product and why? I love the Replenish Serum ? I use it first thing in the morning and last thing at night. My skin drinks the stuff and it doesn’t feel greasy. Makeup philosophy: Not much! I wear an organic tinted moisturiser with sunscreen and try to use products that are as natural as possible. I think skin should breathe! Makeup bag essentials: Eyeliner & red lippy. You never know when you’ll need to top up.